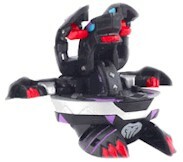 Alpha Hydranoid is a Bakugan and the final and second evolution of Hydranoid. Alpha Hydranoid has three heads (with an addition of a frill on each one), three tails, and a dark skin tone that makes him difficult to see at night, in addition, he has six wings on his back which makes it capable of flight. Its metal armor can sustain multiple blows from attackers, and its fire blasts can melt all elements. He also has the saw horns from his original form. He now has wings with snake-like mechanical tentacles coming out that he can use to trap his foes. He uses the tentacles in combination with the saw horns on his chest in order to reduce their G-Power a constant rate. Alpha Hydranoid has been released in the Special Attack with Heavy Metal. The highest G-power version of it is Darkus, has a score of up to 730 Gs. The real marble of Alpha Hydranoid is different from the one in anime, the wings near the central head is changed into side heads. It appears as Pyrus, Haos, Darkus, Subterra, and Ventus. Alpha Hydranoid isn't available in the Bakugan Battle Brawlers Video Game, though he is available in Bakugan Battle Brawlers: Battle Trainer. Purchase your Alpha Hydranoid from Amazon now! Copyright © 2008 - 2014 go BAKUGAN.com bakugan Toys & Bakugan Balls. All rights reserved.